No camper-trailer is complete without a kitchen. Find out more about design and component options to get yourself cooking. The first kitchen decision is where to put it. Most commercial trailers locate the kitchen as a slide-out from the side of the trailer, or (in the case of side-fold designs) from the rear. Some trailers (such as the Ultimate) have a galley-type kitchen inside the trailer. There are pros and cons to each option. The big advantage of outside slide-out kitchens is that they can be quickly accessed without having to set up the trailer. Great for making lunch on the side of the road. The downside is that using them in bad weather means setting up an annex. So what's ideal for you may be a combination of personal preference and your most regular destinations. If you usually make top end or central-Australian trips in the dry season, then weather probably isn't as much of an issue as someone who tours the Southern states. If you do prefer an indoor kitchen, then a possible compromise is to install a small prep table on the outside of the trailer, with the full kitchen inside. Because my kitchen is an outdoor design, that's what I'll detail on this site. 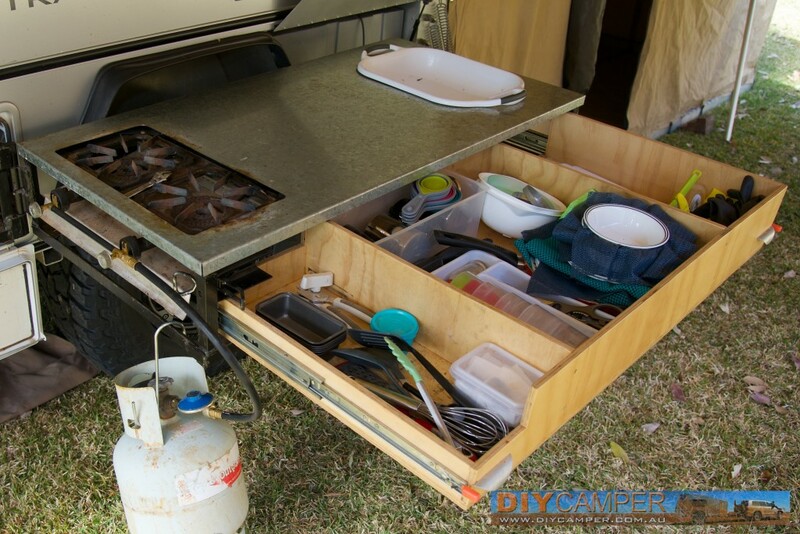 Typically, camper-trailer kitchens only include a gas stove for cooking. Diesel stoves are also available and offer much more economical operation and easier fuel storage, but cost substantially more at the time of purchase. There are a huge variety of gas stoves available, in shapes and sizes to suit any kitchen design. I was on a tight budget at the time, and rather than using a purpose-built stainless stove I simply incorporated a cast-iron 2-burner stove into my kitchen during fabrication. I also wanted a small microwave to provide fast reheating when power was available, and at less than $100 they are a very cheap cooking option if you have the space. 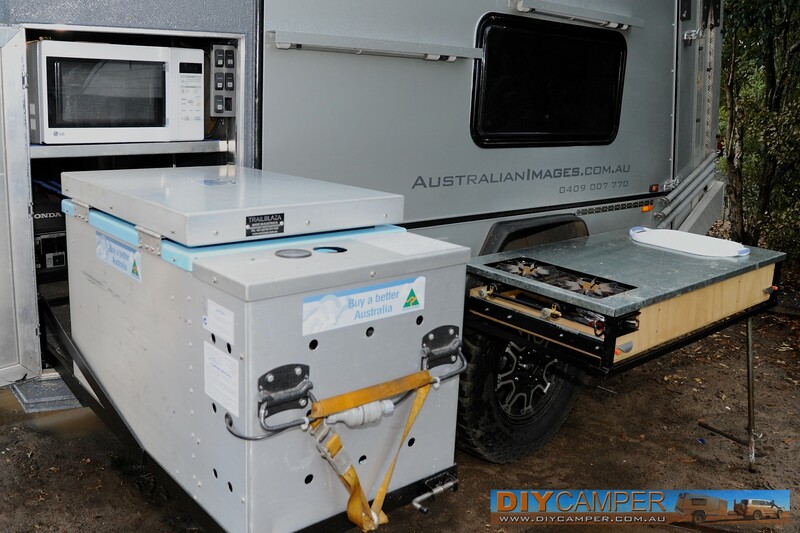 A fridge is an essential part of any camper-trailer build, even if you already have one in your tow vehicle. There are plenty of brands available, many of which work very well. I personally have two Trailblazas, which I've always been extremely happy with, but they do take up a lot of space due to the thick insulation. Alternatively, stick to a name-brand 12 (or 12/240v) compressor fridge such as Engel or Waeco rather than going cheap with something you've never heard of. The last thing you want is a fridge that uses too much power and/or can't cope with the temperature or vibration extremes experienced in outback Australia. I generally do not recommend '3-way' gas/12v/240v fridges, as they tend to be extremely inefficient when operating on 12v. However, they are very efficient when operating on gas, so they may be a good choice if you plan on long stays at a single location running the fridge on gas, particularly if there is a lot of shade which limits the power generated by solar panels. As with gas stoves, there are a wide variety of small sinks available which can be incorporated into a custom kitchen design. These can be combined with taps and pumps to deliver water to the kitchen. In my case however, I decided to go with a Willow 12L plastic tub (which can be simply lifted out of a recess in the benchtop) rather than a sink. I did this to avoid the complication of having to drain the sink outlet away from the trailer. This was made easier by the use of twin Dynaplas 38L water tanks located behind the wheel arches, with manual taps to access the water. 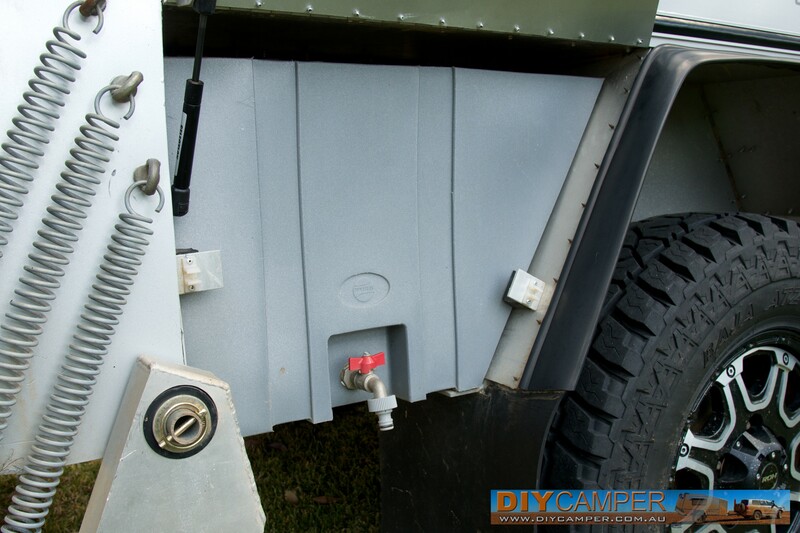 If you use a plastic water tank located underneith the trailer, make sure it's protected by a steel bash plate. You'll also have to use either a hand pump/tap or electric pump combined with a tap to gain access to your water supply. Make sure you use a food-grade drinking water hose to refill your water tanks, to avoid the 'plastic' taste you get when using a standard garden hose. My kitchen is a completely custom design, sliding out through a hatch on the left side of the trailer, then turning 90º so that it sits along the side of the trailer, with the end then supported on a short pole. There is a single plywood drawer located under the benchtop, which slides out on ball-bearing drawer slides . The sink/tub is located at the right end of the benchtop, while the gas stove is located at the left end. The stove isn't permanently plumbed, which eliminated the need for an approved gas installation. Instead, the gas bottle is hung from the kitchen frame and connected via a hose and regulator when required. The fridge is located in the front storage area of the trailer, and rolls out on a custom frame/slide that I fabricated, as there were no commercial slides available to suit the large Trailblaza. If you're using a smaller fridge, then there is a wide range of fridge slides available to suit. The 20L microwave oven sits just above the fridge. If you don't want to fabricate your own kitchen from scratch, there is a growing range of pre-fabricated stainless steel kitchens starting to appear. They typically offer benchtops, sink, tap, pump and drawers in a single unit, although they generally don't include a stove. Buying one of these prefab kitchens can be a fantastic way to get a quality kitchen for your camper trailer, without the time and hassle associated with making one from scratch.